By now you have might have heard of or even been one of the 16.000 (and counting) visitors of the not-to-be-missed "Art Is Comic" exhibition currently showing at MIMA, Brussels. 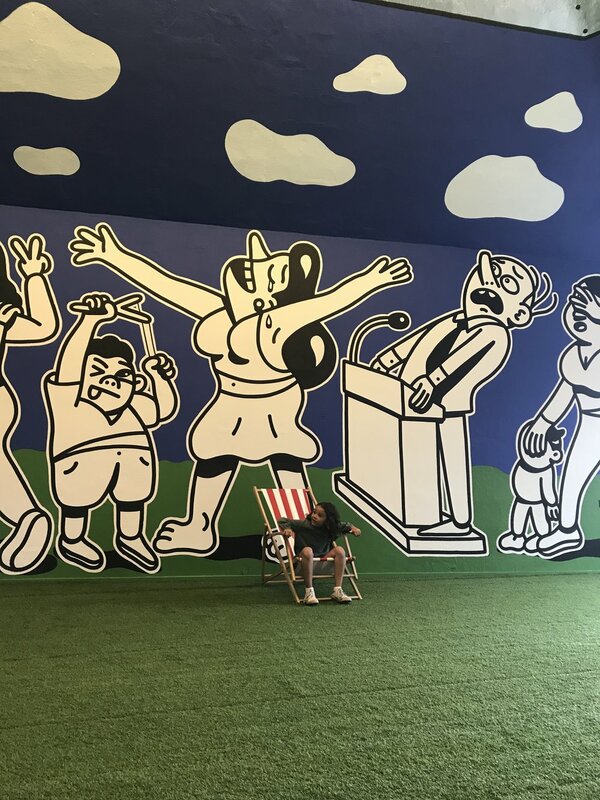 It's the show where you can gleefully watch humour, criticism and extreme drawing talent collide by the hands of Brecht Evens, Brecht Vandenbroucke, HUSKMITNAVN, Mon Colonel & Spit, Jean Jullien and Joan Cornellà. We previously published our extensive talk with guest co-curator and exhibiting artist Brecht Vandenbroucke and now it's high time we let you in on our conversation with HUSKMITNAVN. HUSKMITNAVN (Danish for "remember my name") or HUSK as Alice van den Abeele likes to call him, and we're gladly following suit since he likes to keep his real identity hidden, has been a favoured artist of the MIMA's curator and she has been showing his work at her Brussels' ALICE Gallery for years. For the critically acclaimed "Art Is Comic" show (which earned the museum a 'need-to-visit' nod on VOGUE), Alice & co invited the Copenhagen-based artist to take over the entire MIMA-chapel and staircase. HUSKMITNAVN, who's been at it for 16 years, and whose work is by his own admittance still heavily influenced by soaking up Asterix, Keith Haring and Walt Disney as a child, clearly puts forward a distinctive narrative where in recent works kids can mostly still be kids and adults are rattled and sometimes failing, but most of the time doing their damnest, damned! KNOTORYUS: I don't know if you know, but you got assigned the most important space of the entire MIMA. It's where Alice first got her vision for the museum. HUSKMITNAVN: I think the reason why I got this room is because I'm used to making large-scale drawings and the other artists come from a more comic or graphic background. KNOTORYUS: When did you get asked to do the exhibition? HUSKMITNAVN: Just before Christmas 2016, I think. I could tell from the photos Alice sent me that the room was pretty special. KNOTORYUS: So you saw it when Maya Hayuk painted it. HUSKMITNAVN: Full of colours! Even the windows were painted. I flew over just for the day to check it out. It's a great room, but the angles and ceiling are very difficult to paint, because once you're up on the ladder, you are breaking your neck and back. I just stood here for a couple of hours, looking at the ceiling and thinking: "Can I turn it into something? Perhaps it could be a sky, like you see in a Greek restaurant." (laughs) And then I started wondering: "What can the shape of this part of the ceiling represent?" Because, let's be honest, it doesn't really look like a space ship. But then again, you don't really know what a space ship looks like. I thought: "If I paint aliens in the windows, hopefully people will get the idea." And then I figured that I'd make the characters down here react and relate to what was going on up there. Later on the curators asked if I could also paint the entire stairway. KNOTORYUS: The job got bigger and bigger. HUSKMITNAVN: It always does! I've been painting a lot directly onto walls, and when you have to make big drawings, the following remark always pops up: "We need something over here." Oftentimes it's too late to bring in another artwork, so the curators might as well ask the guy who's already painting the next room to draw something in the corner. But it's fun, because you sometimes come up with better ideas and end up establishing more of a connection between the works. KNOTORYUS: How long did you stay in Brussels, working on this? HUSKMITNAVN: I worked for two weeks straight. Three people have been assisting me. I've been making all the drawings, but it takes a long time since this room is huge. First you have to paint the lines, all the way around it. And you have to do it twice to make the paint cover. Then you have to fill it in and when all that was done we had to paint the sky and the space ships. KNOTORYUS: What is the idea behind the chairs and the grass? HUSKMITNAVN: When I go to a museum or a show, I'm usually there for maybe four minutes. I just sprint through. I never really look at the works and my back always starts to hurt after two minutes because you're walking in such a strange way. I really like the idea of creating spaces within a museum where you can just hang out. When you get to this room, you've already been through half the exhibition. So it's a good place to let the kids run free. It's always a bit depressing when you show your work and you know: "This painting took me a week to make and people look at it for twenty seconds." So I liked the idea of trying to keep visitors inside this space for a little longer. Alice and Raph explained the idea behind the MIMA, to have it be a positive stimulus for its surroundings. They want the museum to make a difference in the area. Of course, there are a lot of great artists who make dark and heavy stuff, but that's not exactly my thing. I want to be able to communicate with children as well as old people and everyone in between. But that doesn't mean that my work is shallow. When people walk into these rooms, they can leave feeling inspired. The best outcome for me would be that if some kid visits, they feel like drawing when they get home. Children mostly do the same thing over and over nowadays. They look at a phone or iPad, they don't play that much anymore. Drawing has given me so much. It's also a social thing, you can sit together with your mum or friends and draw together while talking to them. When you are playing games on a screen, you have to stay alert at all times, collect points and avoid dying. You cannot die when you're drawing. KNOTORYUS: That's a great line. Talking about the kids in your drawings, they mostly have it pretty sweet. You see mum and dad, pushing prams, sweating and worrying, but these HUSKMITNAVN-children are chilling most of the time. Is that how you perceived your own childhood? HUSKMITNAVN: No, it's probably more about the way I treat my own children. When I was a kid, we were left on our own more. And I know that my parents were just left to their own devices most of the time and probably their parents were completely without adult supervision. Nowadays, most people are looking out for their kids and trying to be in control of what they're doing, who they're playing with, what they're playing. I would like for it to be different, but I can see everyone around me treating their kids the same way. I don't know if it's because the world feels scarier. KNOTORYUS: I read about when your father left you home alone, he would also leave comic books. At my house it was kind of the same, we got 'Asterix' and 'Lucky Luke', which was more for my brother, because me and cowboys have never been a thing. I don't know if you know the 'The Bluecoats' ('De Blauwbloezen', ed. note), but that was my favourite stuff. You could get lost in these stories and they gave comfort. For me it was never really about the drawings, it was more about well-written stories which sort of became my job later. I was wondering how that was with you? KNOTORYUS: There will always be something to fear from one generation to the next. HUSKMITNAVN: Yes, and most of the time it's completely harmless. Now we are afraid of computers. I think that iPads and social media for kids are much more addictive than comics. You don't need to read five comics a day. KNOTORYUS: Social media has added another dimension to your 'anonymity'. You have a big following on Instagram, but nobody really knows what you look like. A while ago, you said in an interview: "This way no one can come up to me at any given moment to discuss my work, which also means I can switch off when I want to. I'm not that open to people yapping about stuff." And isn't that exactly what happens in the comment sections: people yapping about stuff? KNOTORYUS: Even after all these years, we are still trying to figure out how to include the multitude of technology into our daily lives. HUSKMITNAVN: Exactly! Look, when I first started making art, there was only a certain type of people who would go to galleries and museums. I figured: everyone walks on the street, so it made sense for me to do graffiti. But now, everyone's looking at their phone when they're walking down the street. Everyone is online, so it's natural for me to take my work online. Make the art come to the people, instead of the other way around. I think a lot of these apps like Instagram are basically made for drawings and for art. Some of my small drawings are 5 minute-exercises, but coming back to 'Art Is Comic': when you are painting an entire room, it's the complete opposite. People have to come and see it. You should have seen me, right before you came in, I was trying to take photos of this space for Instagram and my website and it's just impossible. Even when you take 10 photos, you cannot really get the sense of the artwork. KNOTORYUS: That's the extra benefit of the art that's shown here at the MIMA, I think. People are free to take as many pictures as they want, but you still have to come over here to get the full experience. KNOTORYUS: You know that's going to happen, Husk! But you've made space for the kids to do their thing, too. You designed a drawing room together with Jean Jullien. HUSKMITNAVN: Often, in a museum, it looks like the people who work for the museum have designed the drawing rooms. It's strange that artists don't seem to get involved. So my idea was to make a drawing room inside the MIMA. Often when children are walking through an exhibition, they become inspired. And now they can get it out of their system right away. And their parents and grandparents can sit down with them. Everyone enjoys a good seat. If you don't want to draw, you can look at one of the two screens showing a couple of short videos I made and after that you can finish the exhibition by going up and enjoying the roof together with the aliens. That's what you do in a museum: you look out the windows as much as you do at the art. KNOTORYUS: It's part of the whole experience. HUSKMITNAVN: It is. And you have to be aware of that, as an artist. If you think that your artwork is the most important thing in a museum, and that it's all about that, you're mistaken. A museum consists of many important things. The toilet is important, the café is important, the shop is important, the view is important and art is just a part of that. Of course, people come to see the art but oftentimes you'll hear: "I don't know anything about the artists, but the café is really good." KNOTORYUS: The pizza at MIMA is great.